This groundbreaking volume covers the significant advantages of wave technologies in the development of innovative machine building where high technologies with appreciable economic effect are applied. These technologies cover many industries, including the oil-and-gas industry, refining and other chemical processing, petrochemical industry, production of new materials, composite and nano-composites including, construction equipment, environmental protection, pharmacology, power generation, and many others. The technological problem of grinding, fine-scale grinding and activation of solid particles (dry blends) is disclosed. This task is common for the production of new materials across these various industries. At present in this sphere the traditional methods have reached their limits and in some cases are economically ineffective from both scientific and practical points of view. The authors have detailed, through their extensive groundbreaking research, how these new methods, based on wave technology, can be used to create new, more efficient and less expensive applications and materials for industry. From increasing oil recovery to building stronger machines more efficiently and creating more productive membrane separation devices, wave technology can be used as a fertile ground for product innovation and more efficient methods of production across a variety of industries. This book is the only one of its kind in the world and offers a unique and invaluable glance into this sophisticated and complicated scientific area that is only now being more fully utilized for its valuable benefits. R.F. Ganiev is a professor and a member of the Russian Academy of Sciences, Doctor of Technical Sciences, Director of the Institute of Engineering, Director of the Scientific Centre of Non-linear Wave Mechanics and Technologies of the Russian Academy of Sciences, Head of the Chair of applied physics of Moscow Aviation Institute, and the Chair of computational models of Moscow Institute for Physics and Technology. He is a specialist in the field of mechanical engineering, non-linear oscillations and wave technology. 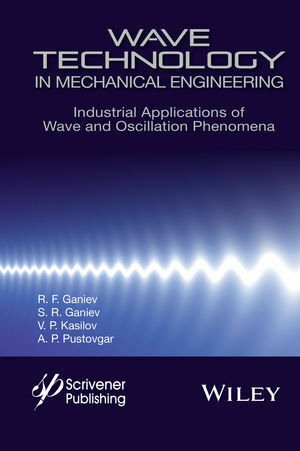 S. R. Ganiev, PhD, is a specialist at the Scientific Centre of Non-linear Wave Mechanics and Technologies of the Russian Academy of Sciences. He is a specialist in the field of mechanical engineering and wave technology. V.P. Kasilov, PhD, is a leading scientist at the Scientific Centre of Non-linear Wave Mechanics and Technologies of the Russian Academy of Sciences and is a specialist in the field of electro-mechanics, mechanical engineering, and wave technology. A.P. Pustovgar, PhD is a vice-rector of Moscow State University of Civil Engineering & Construction and a leading specialist in construction materials science.